As a way to express our gratitude for your referrals, we’re officially launching our Tela Program — a referral rewards concept! Like a piece of woven fabric, or tela, we are all connected in this work. Agua y Sangre Healing aims to be a community in wellness that supports one another in our personal and collective healing. Like Oshá and the Aspens – we envision this work as symbiotic, as mutually beneficial. Where you are not a passive participant, but fully empowered and gently supported to awaken your own healing abilities; which, have a collective and radiating effect that also help to heal your loved ones, your communities, and help to heal us. Help us strengthen and grow our community. As we expand our practice, we’re asking you, our current clients and supporters, to help us strengthen and grow our beautifully woven and connected community by helping others seeking compassionate and empowered care to find us. Invite your loved ones to connect with us on Facebook + Instagram. an extra 15 minutes // OR // 15% off their next session! // PLUS // you get to enjoy the very same oferta at your next session! We’ll make a note in your file and have a coupon for you at your next visit to either take 15% off* or add an extra 15 minutes for a future session (your choice!). Coupons will be good for 3 months after your friend comes in. Referral deal cannot be used in combination with any other offer or discount. Adding 15 minutes to your session will depend on availability and cannot be guaranteed if you are late. 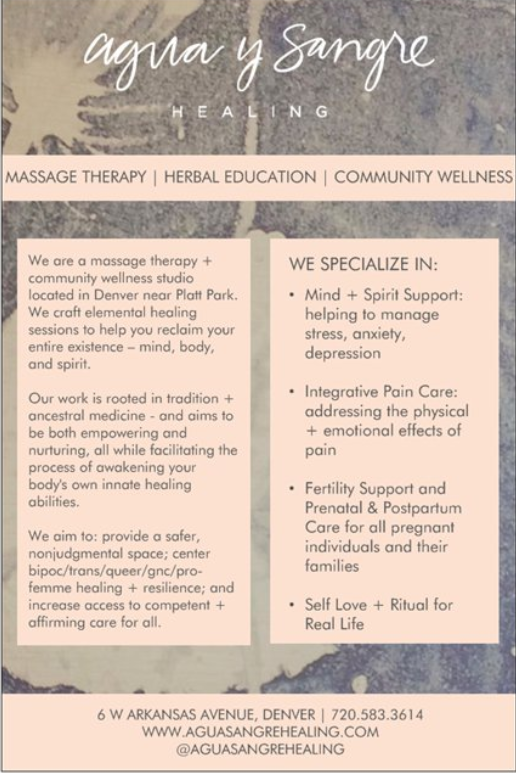 Extra time is currently only for massage sessions – we apologize for the inconvenience and are working on an alternative for herbal consultations! The referral coupon is issued when the new client comes in for their first session, as such, these rewards cannot be applied preemptively – i.e. when purchasing gift certificates – however we will make sure you and the person to whom you gifted a session will still get referral coupons to use at a future session once they come in to use their certificate. *Discount is applied to services only, cannot be applied to the cost of products.